On a long drive this week I enjoyed a marathon of Freakonomics Radio, one of the most interesting and informative podcasts around. So I begin this post with a massive hat tip to their 2011 show called The Upside of Quitting. That episode centered on the efficiency gained by knowing when to quit, even if doing so runs counter to a prevailing norm that quitting is somehow nearly always bad. The anti-quitting bias is one that we all tend to carry with us into the LSAT. Just like most real world experiences we bring to the test, this bias can hurt us. Knowing when to avoid entirely or retreat from a question getting the better of you is a valuable skill that can make the difference between your first-choice school and your second. In today’s application environment, it can be the difference between winning or losing the grants or scholarships that otherwise may have been yours. The United States’ response implies an application of the sunk cost fallacy. The amount of money previously committed to the space station is not by itself evidence that any future resource allocation is appropriate. There may be other reasons that support future spending, but past expenditures alone won’t suffice. Regarding opportunity cost, anyone considering spending three years in law school has faced the concept. The opporunity cost of going to law school, when you otherwise would be working for a wage, is the money you will not earn while in school, your benefits, your work experience, etc. David Bernstein wrote about this idea last year over at the Volokh Conspiracy. Unfortunatley, that is a losing proposition. If anything, the fact that it has taken you longer than normal to work the question without success suggests that, for this question at least, the house advantage has won out in the LSAT casino about which Dave wrote recently. Rather than throw “good money after bad,” try to appreciate that your chance of guessing the correct answer has jumped from 20 percent to perhaps 50 percent, and move on. This is the idea of refusing to be mired in sunk costs on the LSAT. As to opportunity cost, every second that you spend grinding away without results on an unusually difficult question is an irreplacable second that you can’t spend on another question. Remember that each correct answer, whether it’s simple or difficult, contributes just one point to your raw score. The opportunity cost of continuing to belabor an extra minute on a question you have a higher than normal likelihood of missing is potentially failing to have enough time left to answer correctly a question you could dominate. In addition to the mere time, there is a psychological advantage to giving yourself permission to move on when the time is right. Don’t let the LSAT push you around or make you into a passive victim of its psychometrically manipulated ordering. It’s your test, take control. 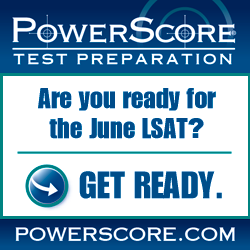 By test day you should know who you are as a test taker, your strengths as well as your weaknesses. Going into the test with a strategy of attacking the questions in an order that compliments your strengths while avoiding your weaknesses is a result of fully grasping the concepts of sunk costs and opportunity costs on the LSAT. Jon wrote extensively about formulating this strategy in a three part series earlier this year. Ultimately, what’s your true objective? Hopefully, it’s to get the highest raw score possible, not to answer every question in order no matter how long it takes. Learning to quit while the quitting is good will help you keep your sanity and improve your score. It’s your test, take control. Photo: “Exit Sign” courtesy of mtellin.